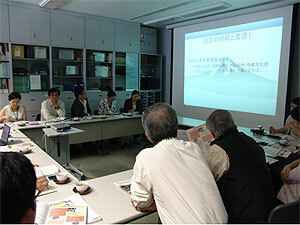 The National Research Institute for Cultural Properties, Tokyo and the National Institute of Cultural Heritage, China started the program for the fostering of the engineers of conservation and restoration of the cultural properties along the Silk Road in 2006, and the joint program will be complete this year. On August 16, the final mural printing and textile restoration and conservation courses started at the National Institute of Cultural Heritage, China in Beijing. 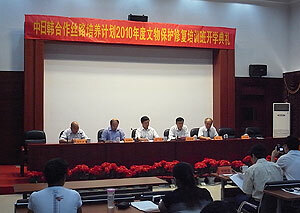 From Shinjang, Gansu, Ningxia, Qinghai, Shanxi, and Henan provinces and autonomous regions located along the Silk Road, fourteen and twelve trainees participating the mural printing and textile courses respectively will attend theory lectures and practical restoration practical training for four months until December 17. Twelve instructors will participate in both courses and some instructors will be invited from Korea. We look forward to getting significant results in the same ways as was possible during the six courses which were executed in the past four years. 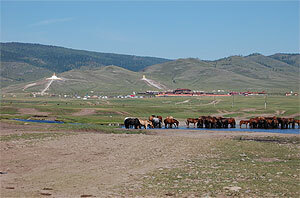 From the end of June to the beginning of July and at the end of August, we conducted a workshop and conservation survey at the Tibetan temple Amarbayasgalant of the Selenge Aimag (province) in northern Mongolia, jointly with the Ministry of Education, Culture and Science in Mongolia. The theme of this year’s workshop was to build a plan for the conservation management of cultural properties, and we set a target for determining a conservation area for the time being. In this 20th year since religious activities at the Amarbayasgalant temple restarted, new building and maintenance of the temple associated facilities stepped up and, and the historical scenery, a key part of heritage values, is rapidly changing. There is also a concern about the influence on the conservation of the underground remains of old temple buildings. To prevent this, we repeated the field survey and discussion together with the representatives of the prefecture, county and local public. We reached the basic agreement for the policy that a wide area, including the surrounding mountains adored by people and the material production site when the temple was built, is to be designated as a conservation region based on the Laws for Protection of Cultural Properties. Meanwhile, the temple consisting of many wooden buildings, suffered deterioration and damage because of aging and insufficient maintenance, and thus part of the damaged building could endanger the safety of human lives. In the August mission, therefore, we conducted a basic survey on the conservation status of all buildings, which served concurrently as the training of young Mongolian engineers, in parallel with the above-mentioned workshop. The report on the results of survey carried out with the four trainees, who also participated in the last year’s practical training, will be submitted to the Mongolian Government. We hope that the report will be used for future emergent measures and full-scale restoration planning. 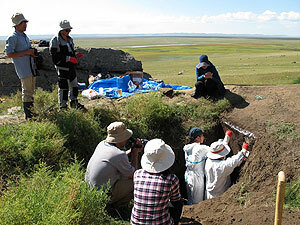 As part of an exchange program of Networking Core Centers for International Cooperation on Conservation of Cultural Heritage commissioned by the Agency for Cultural Affairs, we held an on-site workshop on the conservation of the stone monuments and rock paintings, in late August intended for the experts at the Mongolian cultural heritage center, together with the experts at the National Research Institute for Cultural Properties, Nara. At the workshop conducted at Serven Khaalga and Rashaan Khad in the Khentii Aimag (province), following last year, we conducted a series of surveys on the stone material, deterioration state and ambient environment which were necessary to examine the conservation method of stone cultural properties. 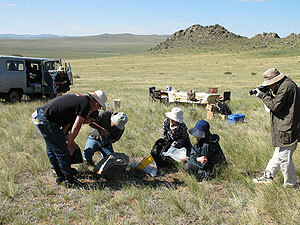 While we worked with the Mongolian experts, we conveyed the specific procedures to them. Along with the survey, we conducted a practical training on the surface peel of the stratum upon request from the Mongolian experts. It was said that it was the first time such training had taken place in the country. We will continue to conduct conservation treatment experiments and a training on the method for evaluating it in Japan, Mongolia, etc. Going forward we will try to gain a better understanding of target sites while working in cooperation with the domestic and overseas organizations, and investigate more appropriate methods of conservation.